Get Your Two Cents Worth! First minted in 1864 as the Civil War raged, the Two Cent Piece was one of the shortest-lived denominations in U.S. coinage history. It lasted only ten years! 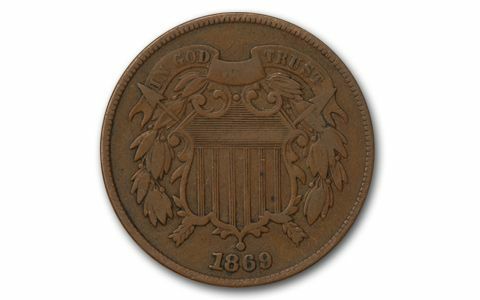 It's gone down in history not only because of its odd denomination, but also because it was the first U.S. regular issue coin to carry the motto "In God We Trust." Now, the motto is on all our coins! We located a small number in collector grade Very Good to Fine condition. Don't miss your chance to add this genuine piece of American Civil War history to your collection!